The ES had fallen back into the middle of it’s 1530/1568 March range with plenty of room to move in either direction. I’ve been waiting on a consolidation day after the wide range days we’ve been having since Monday, but had to plan for another potential trend day within the wide March range. 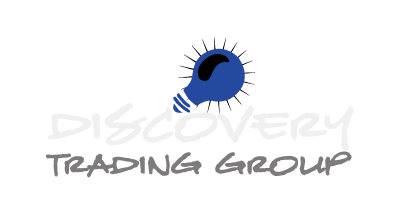 We had a few economic reports in the morning: Jobless Claims, Philly Fed, and Leading Indicators which could provide volatility and directional movement early, but given no reports on Friday; maybe we would finally get an afternoon of consolidation. Thus my plan was to trade early when volatility was expected to be higher. 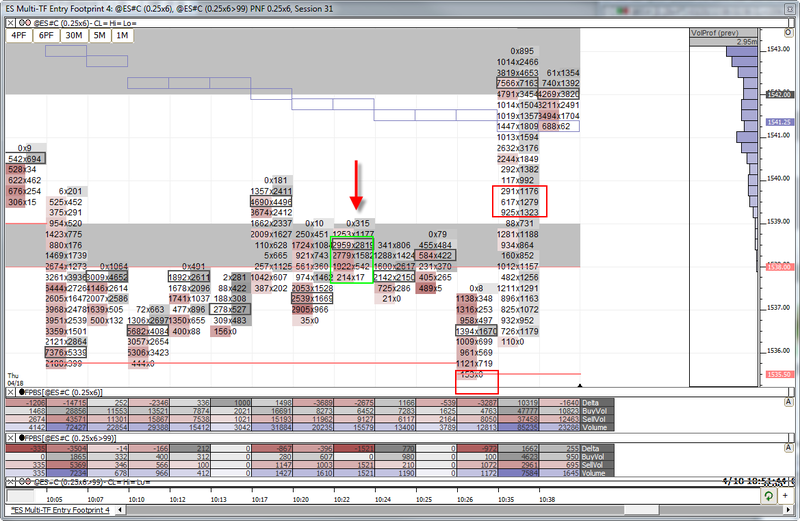 The DTG 42 level was the first level reached and the ES bounced convincingly off the bottom. Volatility was much higher than I had anticipated and the 6 point move down from the cash open was quick. Price made a shallow pullback and unfolded into a long order flow opportunity (although weak given it was 8 ticks from the low) and I jumped. The trade got some traction but ultimately the ES made another down move to the DTG 38 level and slicing through influencing my directional bias to bearish. 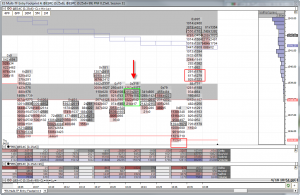 Price pulled back into the DTG 38 level and unfolded into a short order flow opportunity. The ES made another attempt at the low of the day, but quickly bounced after head faking by 1 tick. A bottom was put in and price started moving higher giving me my second loss on the day. The second opportunity is more interesting so I’m using that one as today’s example trade.